We can set you up in just 3 hours! This calculator is for illustration purposes only and is based on a series of assumptions. 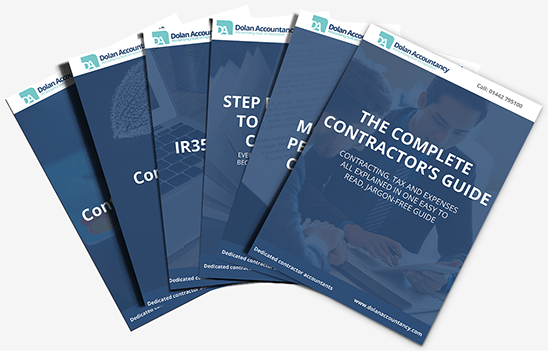 Why Dolan Accountancy - Dedicated Contractor Accountants? For just £95 plus VAT per month, you'll have access to a talented team with decades of contractor accountancy experience. We include everything you'll need to work as a contractor. Free company formation, free business banking and we can have you set-up in just 3 hours. Service is everything and we are confident that you'll be more than satisfied with our service, that's why we give you a money back guarantee. We work with contractors throughout the UK, so no matter where you are, you can count on Dolan Accountancy. We have years of contracting accountancy experience, so you can be sure that we make running your limited company as simple as possible. We will never outsource to anyone, so you can be sure that you can speak to your dedicated contractor accountant when you need to. We understand that if your contract changes you may need to work via an umbrella company. As a Dolan Accountancy client, you can transfer to our award winning umbrella company, ContractorUmbrella for free. The hassle-free, straight talking umbrella company that provides umbrella employment for UK based contractors and freelancers. Independently voted as the best umbrella company by the readers of Contractor UK. Heavy workloads and poor management style are believed to be the key factors for an increase of stress-related absences in UK firms. Small businesses have less than five months from starting up to switch from taking cash only to accepting cards before a shopper’s expectations change. Latest figures show that demand for UK goods and services is growing significantly across the globe. The last 11 years have seen a particularly strong growth in the number of self-employed mothers, accounting for approximately one in eight contractors. With IR35 being extended to the private sector, HMRC has released an open consultation, seeking views on how the off-payroll working rules will work from April 2020. From 1st April 2019, any business registered for VAT will be required by law to store digital financial records and to submit their VAT returns using Making Tax Digital (MTD) compatible accounting software. The Flexible Working Task Force is a partnership across government departments, business groups, trade unions and charities. Dolan Accountancy have been voted runner up in the Best Contractor Accountant Small/Medium category by the readers of ContractorUK. The APSCo has met with both Her Majesty’s Treasury and Her Majesty’s Revenue & Customs to share member concerns around possible changes to IR35 in the private sector. Three quarters of UK small and medium sized businesses are optimistic that they will be able to access the funding they need to grow their business over the next twelve months. James - you are a Legend!!! Thank you for getting this done for me and especially for the due diligence you have shown - evident in the correction you needed to make to reconcile it all correctly - the effort is highly appreciated. Thanks for your help to date, really refreshing getting such fast answers to questions when doing something for the first time. Really appreciate it. Looks like I made the right decision in choosing Dolan for my accounting needs. And once more, from the three companies that the agency said that they work with, yours is BY FAR superior to any of the others. From your website through to my dealings with yourself and Sophie, you 100% outshine the others in every way. Thank you! You really are a rockstar with the quick responses!!! Dolan have been brilliant for me so far as a first timer. Freeagent couldn’t be easier to use and they – well Lauren actually – is lightning fast in responding to emails. Couldn’t ask for more at the moment. I've been very pleased with all the work you've done so far, it really reduces my stress and lets me focus on my business.